Everyone needs a sweet memo board in their house. Where else do you write reminders, shopping lists, messages or words of encouragement? I had an old picture frame that wasn't displaying anything in particular so I decided to turn it into a memo board. 1. Take one old picture frame. 2. Remove the back and insert some pretty patterned paper. If the pattern is quite busy, you may like to insert a piece of plain card so that your memos show up against the background. 4. Use a dry wipe marker pen to create reminders, messages and lists. 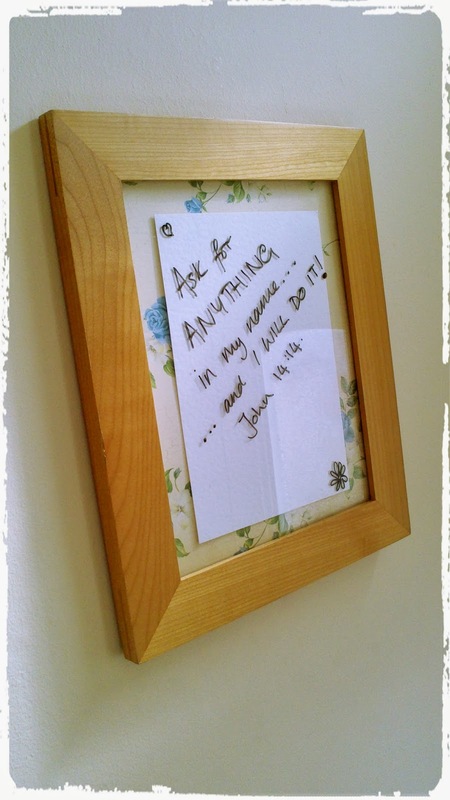 "Ask for anything in my [Jesus'] name... and I will do it!" A great reminder that God is able to fulfill all of our needs and answer all of our prayers if we believe! Thanks Claire - it's so simple but has made such a difference and looks a lot nicer than your average wipe board! If you had a pretty frame you could paint the glass with chalk board paint if you prefer a black board.